The Prince is looking for his Princess, but all the characters of the Court keep their identity secret and do not necessarily intend to help him. He will be able to count on his precious allies to obtain the truth, but will be wary of the supporters of the Black Queen who will do everything to get his advent, while the Servant and Spy will try to deceive both sides. In Princess Legend, take turns playing the Prince and judiciously investigate to unravel the truth of the wrong among the answers of your opponents ... unless they are your allies? 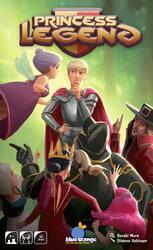 An identity game masked in a medieval universe that will perfect your art of swagger!